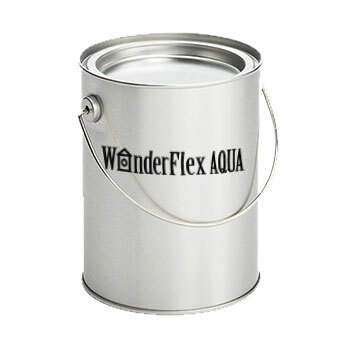 WonderFlex AQUA is an economic, quick-curing, one component, bitumen-polyurethane fluid. It produces a hydrophobic, elastic membrane with very strong adhesion to most types of substrates, as well as bituminous, and excellent mechanical and chemical resistance properties. It is ideal for application on vertical surfaces: No running, no bubbling. RECOMMENDED FOR: repair of asphalt membranes and waterproofing and protection of gypsum and cement boards, cementitious substrates, roofs, light roofing made of metal or fibrous cement, basements, foundations, closed spaces with high humidity. LIMITATIONS: Not recommended for unsound substrates. FEATURES & BENEFITS: Easily applied on vertical surfaces and complex shapes without running or bubbling. Excellent adhesion on almost any type of surface. Excellent thermal resistance, the product never turns soft. Outstanding mechanical properties, high elongation, tensile and tear strength, high abrasion resistance. Excellent chemical resistance. Effective humidity barrier. APPLICATION PROCEDURE: Clean the surface using a high pressure washer, if possible. Remove oil, grease and wax. Cement laitance, loose particles, mould release agents, cured membranes must be removed. Fill surface irregularities with the necessary product. APPLICATION: Apply with brush or spatula or airless spray. CONSUMPTION: 2 kg/m2 in one or two coats. SHELF LIFE: Can be kept for 6 months minimum in the original unopened pails in dry places and at temperatures of 5-25 o C. Once opened, use as soon as possible.